Latest cyber-attack threatened for April 7, will allegedly target Israeli government and military servers. Cyber-terror group Anonymous has issued new threats against Israel and Jews on Tuesday - this time, calling for an "Electronic Holocaust" in a video statement, according to the Daily Mail. The clip features a masked individual behind a news desk, reading a prepared script declaring a massive cyber attack on April 7 - one week before Holocaust Remembrance Day in Israel. The clip then presents the threats like a news report, calling Palestinian Arab terrorists "a symbol of freedom." 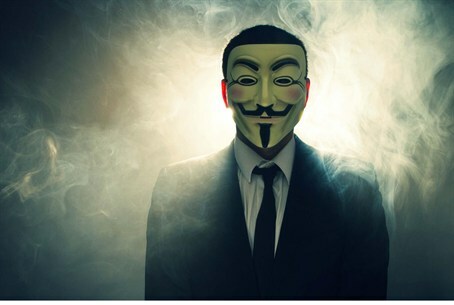 Anonymous threatens to take down "servers, government websites, Israeli military websites, and Israeli institutions" to "erase [Israel] from cyberspace in our electronic Holocaust." "We are coming back to punish you again, for your crimes in the Palestinian territories, as we do every year on 7 April," Anonymous states. "All we see is continuous aggression, bombing, killing and kidnapping of the Palestinian people, as in the last war against Gaza in 2014." "Our message to the foolish Benjamin Netanyahu and all leaders in the Zionist entities, we will continue to electronically attack until the people of Palestine are free." Cyber-attacks on Israeli websites have become more frequent in recent years. Major terrorist groups such as Hamas and Hezbollah, together with Iran, have shown an increasing interest in the field of cyber terror. In 2014, the IDF's cyber defense division was drafted in to mount a defense against a systemic hacker attack - sponsored by the Iranian government - during Operation Protective Edge in Gaza this summer. The Israel Security Agency (ISA or Shin Bet) revealed last year it had set up an elite cyber-defense unit to defend against an organized attack on Israeli cyberspace as well. And in September, the Israeli government set up its own National Cyber Defense unit.